2019 Honda Super Cub C125 ABS NOW TAKING DEPOSITS! Home Motorcycle List 2019 Honda Super Cub C125 ABS NOW TAKING DEPOSITS! COMING SOON! 2019 Honda Super Cub C125 ABS COMING SOON! 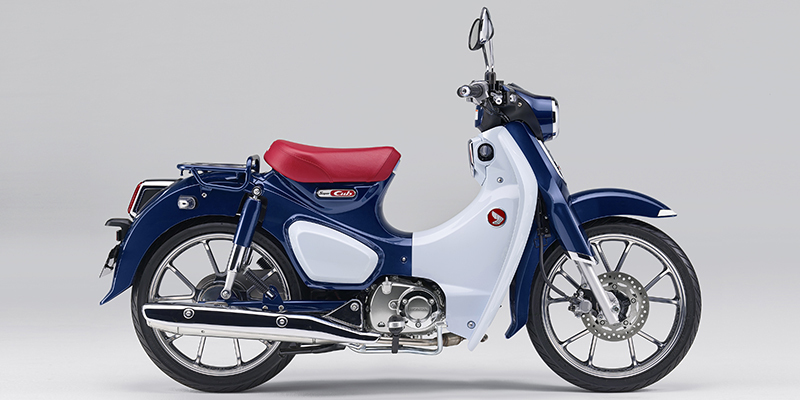 The Honda Super Cub C125 ABS is a standard style motorcycle with an MSRP of $3,599 and is new for 2019. Power is provided by a 4-Stroke, 124.9cc, Air cooled, SOHC, Single-Cylinder engine with Electric starter. The engine is paired with a 4-Speed transmission and total fuel capacity is 1 gallons. The Super Cub C125 ABS rides on Aluminum wheels with a IRC: 70/90-17 front tire and IRC: 80/90-17 rear tire. The front suspension is an Inverted Fork while the rear suspension is a Twin Sided Swing Arm. Front Hydraulic Disc brakes and rear Drum brakes provide stopping power. The Super Cub C125 ABS comes standard with an One-Piece, 1-passenger seat.